Mkts close flat; IT stocks rise. The benchmarking indices closed marginally higher on Thursday, amid volatile trading session. The investor sentiment is positive expecting rate cut by the Reserve Bank in its policy meet next week. 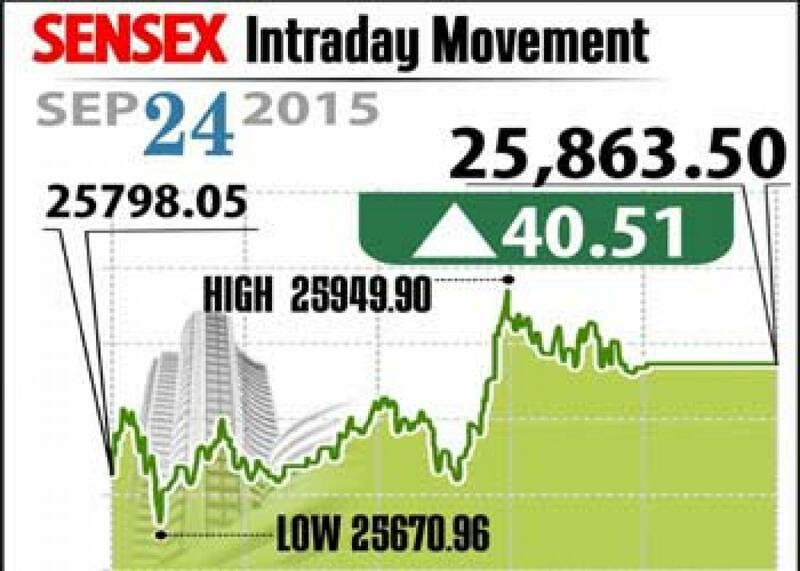 Mumbai: The benchmarking indices closed marginally higher on Thursday, amid volatile trading session. The investor sentiment is positive expecting rate cut by the Reserve Bank in its policy meet next week. Sensex closed up by 40 points at 25,863 and Nifty gained 22 points to end at 7,868. The broader markets have outperformed the benchmarks, as midcap and smallcap indices up 0.2 per cent and 0.6 per cent, respectively. Analysts are of the opinion that the October series may not be good, considering ongoing global economic crisis. They felt unless PSU capex picks up, the domestic recovery would remain the existing levels. The market will remain close on Friday for Bakri-id holiday. On the sectoral front, IT and consumer durable indices rallied around 2 per cent, however, metals, capital goods closed about 1 per cent down. Considering the weak rupee, the shares of information technology companies gained across markets with Infosys, TCS and Wipro gaining up to over 2 per cent each. Following obtaining Europe certification enabling the company to export RE60, the Bajaj Auto shares closed up about 2 per cent. While Maruti stock also gained about 1.5 per cent, since its auto gear shift getting popularised in metros including Hyderabad. The gainers: Lupin, up 3.55 per cent at Rs 1,989.45; Gail, up 2.51 per cent at Rs 294.45; Infosys, up 2.22 per cent at Rs 1,141.40; ITC, up 2.09 per cent at Rs 322.65; and Bajaj Auto, up 1.91 per cent at Rs 2,283.10. The losers: ONGC, down 3.71 per cent at Rs 227.40; Coal India, down 2.79 per cent at Rs 318.60; Tata Steel, down 2.58 per cent at Rs 215.40; L&T, down 2.25 per cent at Rs 1,462.25; and Tata Motors, down 2.11 per cent at Rs 303.65.